The Nokia N8 fails to deliver a satisfying smartphone experience. An excellent camera and great multimedia features aren't enough to excuse the N8's clunky software and frustrating user interface. So where do we start with our Nokia N8 review? Nokia, one of the world's largest mobile phone manufacturers, has been doing it tough in recent years. Despite Symbian being the world's most popular mobile operating system, the company has struggled to produce a high-end smartphone to rival Apple's iPhone and handsets that run Google's Android platform. The N8 smartphone is Nokia's latest attempt at dethroning the new kids on the block and it has a clear multimedia focus; its 12-megapixel camera with Carl Zeiss lens and a Xenon flash is without doubt the best in the game, it records 720p HD video, it has an HDMI port so you can watch high quality footage through a television, and it also supports Dolby Digital sound. Unfortunately, the Nokia N8 suffers from software that isn't as intuitive or easy to use as competitors' offerings, making it a tough sell in an incredibly cut-throat market. Check out our Nokia N8 vs. iPhone 4 smartphone showdown. More information on the Nokia N8 price. Along with its camera and multimedia capabilities, the Nokia N8's physical design is one of its best features. The aluminium body feels excellent in your hand and build quality feels superb. We particularly like the small but classy touches, like the raised screen bezel, and the curved edges; all make the N8 much more comfortable to hold than Apple's iPhone 4. Nokia fans, however, will be disappointed with the lack of removable battery — like the iPhone, the N8's battery is built into the phone and can't be removed. 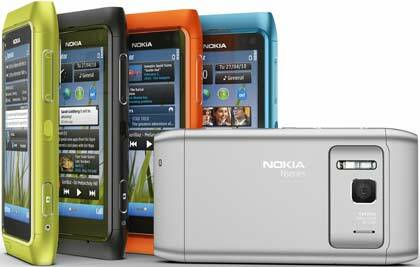 The Nokia N8 is available in five colours including orange, green, black, silver and blue, but the blue and green versions are not available in Australia at this stage. The Nokia N8's display is also much improved compared to previous Nokia smartphones. At 3.5in it is the same size as the iPhone 4's. While it may lack the vibrant colours and higher resolution of the iPhone, the N8's capacitive touchscreen is responsive and possesses excellent viewing angles. Its performance in sunlight is also quite good, though the resolution of the display is lower than the screens on many competing smartphones, so smaller text is often difficult to read. If the Nokia N8 was judged on its hardware specifications alone, it would be a clear market leader. In addition to the afore-mentioned 12-megapixel camera (the performance which we will detail in a separate imaging review), the N8 boasts an HDMI output, Dolby Digital sound, an excellent external speaker, an FM transmitter and USB On-The-Go, which allows the connection of USB flash drives. A mini-HDMI-to-HDMI adapter included in the sales package allows the N8 to be plugged directly into the latest high-definition televisions, and multimedia quality (both audio and video) is excellent. The USB On-The-Go feature is also very handy. We connected a flash drive with a range of audio, image and video files — including a 50 minute DivX file — and all of them played directly off the USB device with no issues. 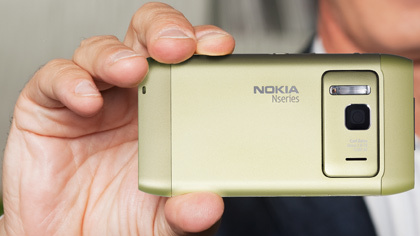 The Nokia N8 smartphone has an impressive 12-megapixel camera with a Carl Zeiss lens. It also features a Xenon flash, and records 720p HD video. The Nokia N8 is the first smartphone to run the Symbian^3 mobile operating system. Symbian^3 improves on its predecessor in many respects and the N8 is smoother, faster and easier to use than devices like the Nokia N97 mini. But the N8's interface still looks inferior to most of its competition and is clunky to use compared to the iPhone and Android phones. Performance is sluggish, especially when you have a few apps open simultaneously. Multitouch zooming, particularly on maps and in the browser, isn't as slick as competitors. Swiping through home screens results in a noticeable delay and transitions between menus aren't smooth. The included Web browser takes longer to load and renders pages poorly in comparison to the competition. It does display Flash, and there are a few nice touches, such as browser history shown as separate thumbnails. But text doesn't automatically fit the screen when zoomed and basic tasks like refreshing the page take way too many touches on the screen. The Nokia N8's hardware and build quality are impressive; the smartphone fits nicely in the hand and has a smooth, well constructed, aluminium finish. Despite Symbian^3 being a clear improvement over its predecessors, it's still evident the OS just hasn't been designed with a touchscreen in mind. A perfect example is the on-screen keyboard; there is no QWERTY keyboard in portrait mode. Instead, the N8 has a numeric keypad with T9 predictive text input. You do get a full QWERTY keyboard if you rotate the phone to landscape mode, but the keys are fairly small and there are no intuitive, context-sensitive buttons like .com. Symbian^3 also brings up a new screen when you have to enter text, meaning you can't see any messages you are replying to as you are typing.